In March 2013, two marriage equality cases were heard by the Supreme Court. It was an historic first in the courtroom, but outside an historic viral movement was underway as well. When HRC introduced “the little red logo that transformed the marriage equality narrative,” millions of Americans sympathetic to the marriage equality cause changed their social media avatars to the now famous pink equal sign set against a bright red background. Earlier this month the little red logo that could earned the civil rights organization a sweep at the SXSW Interactive Awards. HRC garnered recognition in the Social Media, Digital Campaign of the Year and Best in Show categories for a campaign that gave the marriage equality movement a louder voice. The organization’s ability to engage large corporations, celebrities and even President Obama were noted as integral to its unprecedented success. The effort quadrupled traffic to the HRC home page, due in no small part to celebrity endorsements such as Beyoncé’s tweet to her 44 million followers: “It’s about TIME!!! 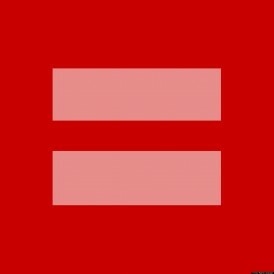 #EQUALITY #MarryWhoYouLove,” accompanied by the HRC logo. The HRC sweep marked the first time an organization or business took home three awards from the ‎SXSW‬ Interactive Awards Ceremony. Posted March 21st, 2014 & filed under Activism.